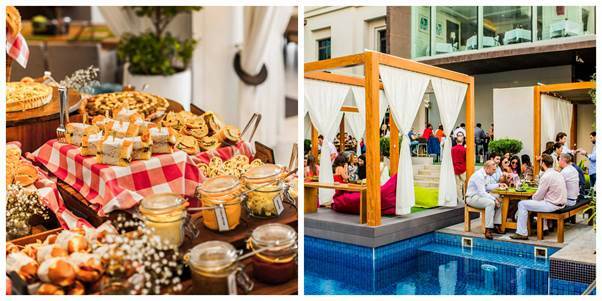 Chill out by the pool in the casual chic atmosphere of 3in1 at the legendary Urban Picnic. Stock your picnic basket with delicious gourmet goodies including sizzling meat from the barbecue and a selection of grape while enjoying our resident DJ’s tunes. If you’re looking for an awesome outdoor poolside brunch, then head down to Vida Downtown’s legendary Urban Picnic brunch. The epic food stations and laid-back vibes are complemented with live music by the resident DJ. Gather your friends to take part in the piñata competition, featuring different iconic cartoon characters like Dexter, Southpark, Stewie to name a few. Winners take home two Urban Picnic vouchers.Entertainment such as football and table tennis will draw guests into an enjoyable mood. With the food menu being served at different stations, the brunch allows guests to indulge in wide variety of dishes, from starters to desserts. Delighting all barbeque lovers, the pool side BBQ station offers a lot of sizzling meat, baked potatoes, buttered corn, grilled seafood, and assorted vegetables. Don’t miss the appetizing sandwich station that will cook-up succulent paper wrapped chicken wraps, pretzel bun filled beef pastrami with Vida slaw and honey roasted take it away Foccassia. Stop over at the nacho station to indulge in nachos filled with chili beef or chilli chicken, sour cream, salsa and guacamole. For the pizza lovers, there is a selection of freshly fired pizzas. The drinks menu will include the finest grapes and house beverages to choose from that are brought to your tableside. For those looking for soft beverages, quirky jugs filled with refreshing juices will surely quench your thirst. Finally, the never-ending fresh fruit platters and skewers, doughnuts, cookies and dips will certainly have you coming back for more. Don’t miss a chance to chill out by the pool in the casual chic atmosphere of 3in1 at the legendary Urban Picnic. Price: AED 295 inclusive of unlimited soft beverages and juices; AED 395 inclusive of unlimited house beverages; Cabanas by the pool are available on first come first basis.